Back in June 2016 the first LimeSDR crowdfunding campaign completed raising over a million dollars in pre-orders at a cost of $249 – $299 per LimeSDR unit. THe LimeSDR is a RX and TX capable SDR with a frequency range of 100 kHz – 3.8 GHz, bandwidth of up to 61.44 MHz, 12-bit ADC and 2×2 RX/TX channels. 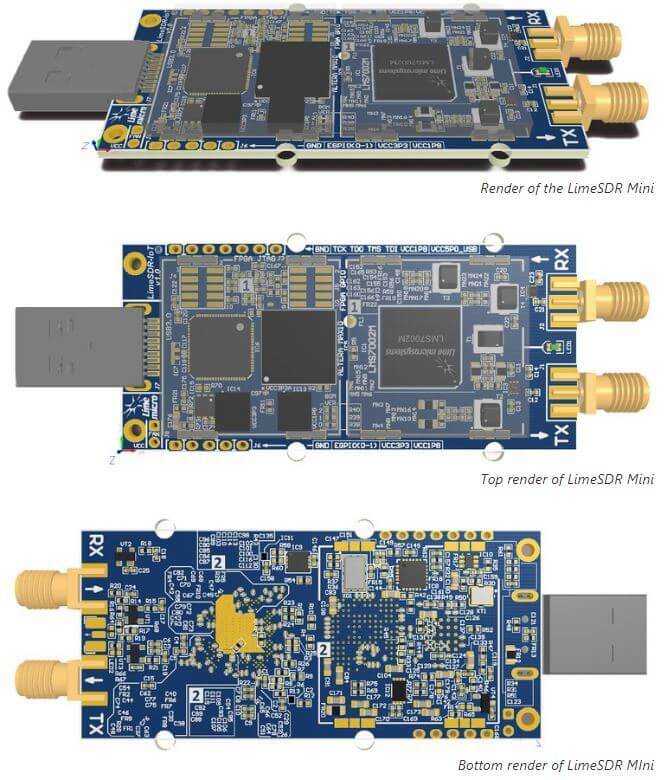 Recently LimeSDR have begun crowd funding for their latest product called the ‘LimeSDR Mini’. This is a smaller and cheaper unit with slightly reduced specifications. The main changes are the slightly restricted frequency range of 10 MHz – 3.5 GHz, and half the maximum bandwidth at 30.72 MHz. The mini also only has 1×1 TX/RX channels. Currently the LimeSDR Mini is being sold on the crowdfunding site CrowdSupply for $139, but the first 500 early bird backer can get the lower price of $99. Accessories such as an acrylic enclosure and set of whip antennas are also available for $40. Crowdfunding is due to end on October 30 and the units are expected to ship on Dec 31, 2017. Note that in the last few minutes that it took to write this article the number of pledges went up by 5 (started at 41), so we’d suggest being quick to claim the early bird if you are interested. The LimeSDR Mini looks like it could compete favorably with the PlutoSDR, which is another recently released $99 SDR with TX capabilities. Both the PlutoSDR and LimeSDR Mini are 12-bit devices, but the LimeSDR Mini has the larger 30 MHz bandwidth available, and can tune lower. In contrast the PlutoSDR only has a stable bandwidth of about 4 MHz, although it can be pushed higher with dropped samples. The PlutoSDR also has a tuning range (with hack) of 70 MHz – 6 GHz, vs the 10 MHz – 3.5 GHz of the LimeSDR Mini. Another plus of the LimeSDR products is that they are fully open source. These are exciting times for SDR enthusiasts with cheap TX capable radios now starting to proliferate on the market! Now, it costs $139 but it may support them. The only possible issue I can find with this device is that it can not be used with Odroid or Rock64 ARM boards (unless you install android on them). The switch to the FTDI USB 3.0 chip means that there is no ARM driver for a normal linux distribution ( http://www.ftdichip.com/Drivers/D3XX.htm ) at least for USB 3.0 maybe the device can function in a lower performance mode with the USB 2.0 driver (D2XX Drivers) which does support ARM. But this is probably a non issue, since most of the drivers are currently in BETA it may just means that they have a small team of software developers and have not written a ARM driver yet. The drivers have all left beta since early October, but still no direct Linux support for ARM even with their blobs (other than if you are android). In china, an ad9363 used in pluto sdr costs 135RMB(21USD). I am starting with sdr and I have a question: does those parameters – mostly bandwidth ? 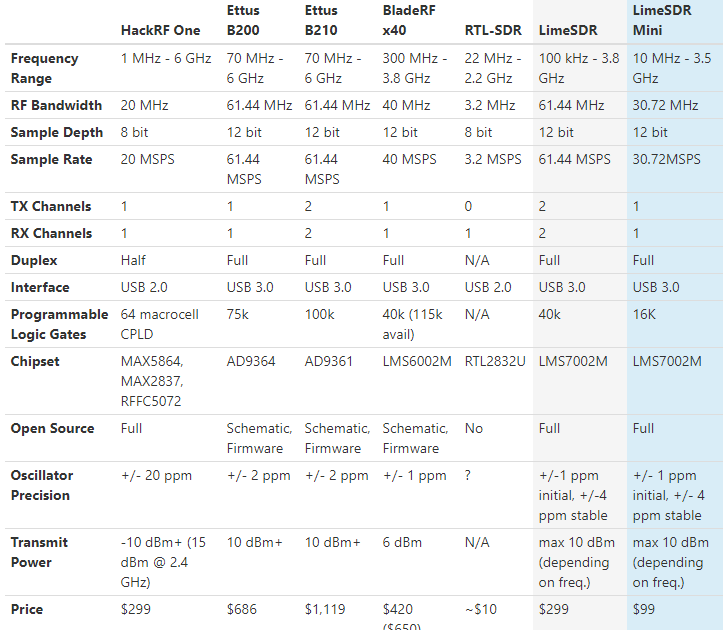 – are ok for do some GSM/LTE work/experiments ? Or maybe Pluto will be enough ? 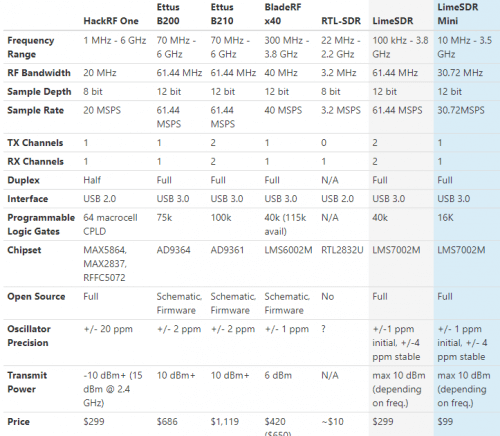 The Pluto SDR has a USB 2 controller… Not very good at Bandwidths greater than 5MSPS, the Lime Mini has the same USB 3 controller as the original LimeSDR… it would benefit you much greater for GSM/LTE experiments than a Adalm Pluto SDR. Both have steep learning curves, so just be aware of that. Largest LTE channel in-use right now is 20 MHz (really 18 MHz) so LimeSDR mini should be fine. Not counting LTE-Adv though. Got mine with 9 left remaining (that was close).